The history of the Otago Region is very rich and interesting. 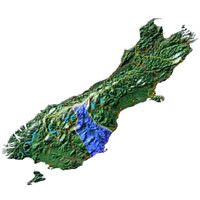 Its well-known for disputes between the different Maori tribes, the European Settlement and the gold mines. Dunedin, the main city of the region is well-known for its university and classical 19th century architecture. Due to its roots, you will feel a Scottish way of life there straight away. Otago offers some of the country's best fishing to its top vineyards, the thrill of mountain biking through remote tussock to the leisurely pleasure of a stroll through wild mountain flowers. Arts, crafts, fine regional food. Jet boating, gold panning, and ice skating outdoors are all on the menu. Starting in Alexandra Central Otago, Clutha River Heritage Cruises will take you back in time down the stunning Roxburgh Gorge into the rich Gold Mining history of Central Otago. Along the way you will view some of the best examples of Gold Miner's rock shelters, huts and Gold workings in the country. You will visit the legendary Doctors Point Gold mine from the 1860's and try your luck at Gold Panning. Laurence your guide is also fluent in French and Spanish. Do not miss the Royal Albatross Colony. This is the unique mainland albatross colony in the world. You will know all about the interesting wildlife of these birds. The stopover for Taiaroa is included in the visit. Elm Wildlife Tours are the ultimate award winning New Zealand wildlife adventure. Albatross, Penguins, Fur seals, and Sea Lions and many other marine and estuarine species – Small group tours of 5-6 hours duration. Discover the treasures and special stories of this amazing region at the Otago Museum, just minutes from the city centre. Don't miss one of the best live tropical butterfly experiences in the world! Open 7 days from 10am – 5pm. 419 Great King Street, Dunedin. Ph +64 3 474 7474. The easiest place to view good numbers of the little blue penguins in N.Z. is at our respected conservation and research site. Informative and entertaining guided commentary, visitor centre and retail souvenir shop compliment your viewing experience. We are easily located en route between Dunedin and Christchurch and from central Otago through the scenic Waitaki Valley. The Museum will open immediately following the Dawn Service. Join us for morning tea and ANZAC biscuits in the Josephine Foyer, opposite Queens Gardens. Toitu OSM – Josephine Foyer. Remember the fallen at Gallipoli with "rosemary for remembrance", available at the Museum entrance between 10am and 12pm. Anzac biscuits will be available for purchase at the Museum Café. No surcharge at the Café or Shop. Museum Foyer. A night of string filled band action and bass-heavy Disc Jockeys. A star-studded line up sporting some of our finest local talent including hot donnas and everyone's favourite local Hip hop prodigy Wax Mustang. Come along and enjoy our new Scottish arts, crafts and clothing dress ups. Toitu OSM - NZR Foyer. Pint Night Thursdays at Dunedin Social Club! Featuring local bands and local beers starting at $5! With a rotating line up of your favourite Dunedin talent, Thursday nights there is no better place to be than DSC! Live Music every Friday night at Dunedin Social Club! Featuring a rotating line up and tunes to keep you pumping till the early hours of the morning! Check out our Facebook page to see who's playing this week. Darn good music for Darn good people, the Portobello Blues Festival is a music festival encompassing concerts, workshops and open mic.